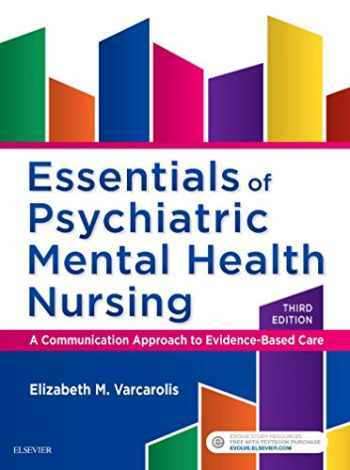 Acknowledged author Elizabeth M. Varcarolis RN MA wrote Essentials of Psychiatric Mental Health Nursing: A Communication Approach to Evidence-Based Care, 3e comprising 512 pages back in 2016. Textbook and etextbook are published under ISBN 0323389651 and 9780323389655. Since then Essentials of Psychiatric Mental Health Nursing: A Communication Approach to Evidence-Based Care, 3e textbook received total rating of 3.5 stars and was available to sell back to BooksRun online for the top buyback price of $19.89 or rent at the marketplace. Awarded third place in the 2017 AJN Book of the Year Awards in the Psychiatric and Mental Health Nursing Category. Get a full understanding of today’s psychiatric nursing practice in less time! Essentials of Psychiatric Mental Health Nursing, 3rd Edition offers the perfect balance of essential nursing interventions and clinical content paired with current research and evidence-based practice to fully equip you for today’s field of mental health nursing. This new edition continues to retain the reader-friendly style, emphasis on therapeutic communication, and the nursing process organization that was successful in the previous edition. It also includes additional DSM-5 disorders, illustrations of various neurobiology disorders, a new neurobiology learning tool, and new NCLEX review questions to help you pass your course and thoroughly prepare for the psychiatric nursing section of the NCLEX.REVISED! Examining the Evidence boxes explain the reasoning behind nursing interventions and how research affects everyday practice.UNIQUE! Applying the Art sections in the clinical chapters provide examples of therapeutic and nontherapeutic communication techniques as well as realistic nurse-patient interaction scenarios.Chapter review questions reinforce essential content from the chapter.Critical thinking questions introduce clinical situations in psychiatric nursing.Nursing Interventions tables familiarize readers with interventions for a disorder that they will encounter in clinical practice.Key concepts and terms clarify essential terminology.Vignettes offer succinct, real-life glimpses into clinical practice by describing patients and their psychiatric disorders.Assessment Guidelines familiarize readers with methods of assessing patients.Potential Nursing Diagnosis tables give several possible nursing diagnoses for a particular disorder along with the associated signs and symptoms.DSM-5 diagnostic criteria identifies medical diagnostic criteria for psychiatric disorders for integration into the nursing plan of care.Important contributions from psychiatric mental health nursing pioneers are featured in the opening unit pages.Cultural Considerations sections reinforce the principles of culturally competent care.Key Points to Remember outline the main concepts of each chapter in an easy to comprehend and concise bulleted list.Appendices feature the DSM-5 Classifications and a list of the latest NANDA-I diagnoses for readers’ reference.NEW! DSM-5 content provides the most up to date information on the latest DSM-5 disorders.NEW! Illustrations of various neurobiology disorders give readers a clear picture of how the disorder affects brain function.NEW! Neurobiology teaching tool visually guides readers in learning about various neurobiology disorders and relevant medications and side effects.NEW! NCLEX review questions on the Evolve companion site provide additional practice on the type of psychiatric nursing content found on the latest NCLEX test plan.NEW! Image collection on the Evolve companion site offers a visual supplement to help learn and reinforce concepts.